Do you love Italian food but struggle to find high quality ingredients in your neighbourhood? NifeisLife has the answer. With a NifeisLife voucher, you can enjoy amazing savings on a wide range of Italian cheeses, meats, drinks, desserts and more. So whether you're passionate about authentic gelato or a fan of fine Italian wine, a NifeisLife voucher code will help you indulge in your favourites without breaking the bank. NifeisLife was founded by Paco Nicodemo and Raul Longobardi as a reliable online retailer of quality Italian food and ingredients. Realising that many ex-pats and Italian food lovers living in Britain were struggling to get hold of the products that needed, the pair founded a pioneering internet deli service that paved the way for the online Italian food retailing scene. NifeisLife first came of the attention of the country's gourmands and foodies with its Buffalo Mozzarella di Campania, a popular ingredient with several top London restaurants. With a limited worldwide circulation and authentic DOC quality-assurance mark, this fine cheese soon became the company's best-selling product and cemented their place on the food radar. Acquiring several loyal fans over the years, the company was able to grow and expand to offer a wide selection of authentic Italians foods. 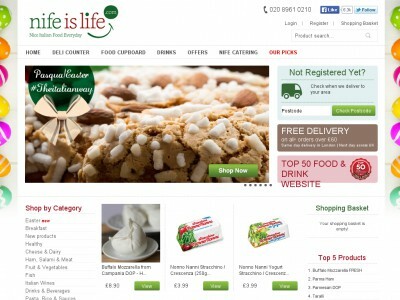 In 2005, NifeisLife expanded their business to offer a direct to customer delivery service – making shopping for delicious Italian products easy, hassle-free and efficient for all their customers no matter where they were based. This was followed by an exclusive same-day delivery service offered to selected London addresses, allowing lovers of Italian dining in the capital to get the very best ingredients delivered to their homes and offices in record time. NifeisLife counts famous chefs such as Nigella Lawson, Rick Stein, Tom Aitkens and Giorgio Locatelli among its fans, each attracted by the freshness and quality of the products on offer. Customers at NifeisLife's online store can browse a dazzling array of treats and temptations, from Italian hams, salamis and cheeses to fresh, seasonal fruit and vegetables, gelato, fish, oils and dressings and much more. They stock products from all the top Italian brands, including Barilla, Mulino Blanco, San Pellegrino, De Cecco, Ferrarelle, Nonno Nani and plenty more besides. And if you're feeling a little thirsty after all that food, there's even a selection of fine Italian wines on offer to provide the perfect accompaniment to any meal. Want to get shopping with NifeisLife? With a NifeisLife voucher you can enjoy fantastic savings on their wide range of delicious Italian food and ingredients. So whether you want to recreate the memories of a favourite holiday or treat a melancholy ex-pat to some flavours from home, a NifeisLife discount code will save you money while you shop. Wide selection of artisan Italian food and ingredients from authentic producers. Browse our website until you find a NifeisLife voucher that suits you, then navigate to their website to begin shopping. Click on a product for more information, then click 'Add' to buy. Review your order and click 'Checkout now'. Click to create a new account. Enter your address details and personal information. Enter your NifeisLife promo code in the box provided. If you've enjoyed shopping at NifeisLife, you might also like to check out more great deals on delicious food and ingredients at stores like Ocado or Sainsburys. Or, if those aren't up your street, you'll find plenty more stores to browse in our Food and Drinks section. Enter your NifeisLife voucher in the box provided. Choose your payment method and click 'Continue to payment details'. Standard UK delivery is free on all orders over £60. For orders below £60 a delivery charge applies. Need to speak to the team at NifeisLife? Whether you have a question about your order, want more information on a specific product or simply want to find out how you could make big savings with a NifeisLife discount code, you can contact the Customer Services department by accessing the online contact form here. Want to discover more from NifeisLife? Why not follow the company across your favourite social media networks? You'll enjoy access to lots of interesting content including competitions, special offers, recipe ideas and more. You can also use these pages to find out more about saving money with a NifeisLife promotional code. Don’t forget to check them regularly, as you can never be sure when a free NifeisLife voucher might be waiting for you! Buy now online at www.nifeislife.com. I loved the food I ate while on holiday in Italy, but I couldn't find the right ingredients to recreate it at home. Then I discovered a NifeisLife voucher online. At nifeislife.com you can shop for an amazing array of authentic Italian food from artisan producers – all available at a discount with a NifeisLife voucher code. I used my NifeisLife discount code to get a fantastic deal on some delicious meats and cheeses as well as quality olive oil for cooking. So why not treat your taste buds for less with a NifeisLife voucher.